Parking is limited in Breckenridge, so we’ve added some links to help you be prepared and navigate the town more easily. Red Route: This stop in the middle of the parking lot and to the central bus station. Yellow Route: This stop is near the entrance to the parking lot on Airport Road and goes to Beaver Run eventually. There is more information about the bus (Free Ride) and routes below. 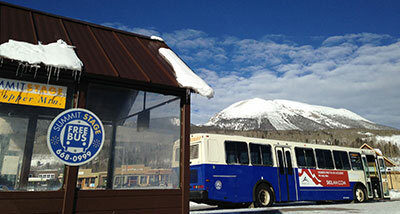 Breckenridge has a free bus system, called Free Ride, serving most of the town. View the printable Bus Map (courtesy of GoBreck.com) and Free Bus Schedule. The Free Ride is a collaborative service of the Town of Breckenridge and the Breckenridge Ski Resort providing public transportation service in Breckenridge. We offer free public transportation within the Town limits of Breckenridge. See our winter route and schedule information online, check the bus stops for departure times, or use our Interactive Schedule. Whether you are vacationing with the entire family, enjoying a relaxing weekend for two, or making your way to work, the Breckenridge Free Ride is designed to make your transit experience a pleasant one. For the betterment of our environment, our goal is to get people out of their cars. Each color-coded bus route is specially designed to move you within the Town of Breckenridge & to the Breckenridge Ski Resort absolutely free of charge and with ease. View the System Map to determine which buses travel to your desired destination. There is generally never more than one transfer required to get most anywhere within the Town. Next, view the Route Map to determine the name of your closest bus stop. Then, either use the Interactive Schedule or view the on-line schedule timetable for the route. All scheduled service times listed are Departure Times, are traffic and weather permitting, and are listed in minutes after the hour. For example, “0:15” means that the bus departs the listed bus stop at fifteen minutes after each hour, during the normally scheduled operating hours. Multiple times listed for the stop indicate that the stop has a bus departing more frequently and at the times listed. Note that some routes may operate only during certain times of the day or evening. We strive to do our best to meet our advertised schedule times; however at times, we may be running slightly behind and we do apologize, but safety is our top priority. Please arrive at your stop a couple of minutes early. The bus does not stop unless someone is present at the bus stop. We are also unable to wait for incomplete boarding parties. All schedule times are traffic and weather permitting. Hours of Operation 6:15 am – 11:45 pm, 7 days a week. Summit Stage offers free public bus service throughout Summit County, Colorado, with service to ski areas, lodging, downtown areas, shopping, medical centers and some residential areas. View the Winter Schedule. The Summit Stage strives to deliver free, safe, reliable and courteous public transportation to all our guests in Summit County. Summit Stage’s SmartBus system allows you to view real-time bus locations on their routes. Riders can access real-time information about routes, stops and bus locations from a variety of devices. You can download the app, text for arrival times or see the map via your phone. $61 one way from DIA to Breckenridge in 2019 when booked online through Big Beers link.